The following account is taken direct from Mary Jones' 'History of Chudleigh' (1875). A dreadful fire, known as the Great Fire, and which forms quite an epoch in the history of the town, occurred on Friday, May 22, 1807. It broke out, accidentally, at noon, in a baker's house, in Culver-street. At first no apprehensions were entertained of its spreading; but as there had been a long continuance of fine weather, everything very dry, and a brisk east wind springing up, the burning flakes were conveyed to different parts of the town. The flames soon spread to Mill Lane, then across to Exeter-street in which stood the King's Arms Inn – one of the important posting-houses of the town, much in request at that time from the travelling consequent on the war. The stables and back premises of this inn, as throughout the town generally, were thatched, and in many instances on fire before the dwelling houses. The terrified inhabitants, while endeavouring to save their goods, found themselves hemmed in by the flames, and had only just time to escape with their lives, leaving much valued treasure behind. The flames extended with fearful rapidity, and three streets were on fire at the same time. The Market House served at first for a depository for furniture &c., but it was quickly abandoned, and destroyed with its contents. At 2 o'clock a barrel of gunpowder, which had been forgotten in a storeroom, blew up, shaking the town to its centre, and scattering books and papers more than a mile distant, at the same time giving a fresh impetus to the flames while it added to the general alarm. The only fire-engine was soon burnt. To the affrighted inhabitants the place seemed doomed to utter destruction, while they were unable to form any organised plan for its suppression. As the fire in the centre of the town, where the flames had raged in terriffic grandeur, abated, it was thought advisable to pull down a few houses to intercept the fire, and save, if possible, the extremities of the town. Assistance being obtained from the neighbourhood, this was accordingly done, and the fire subdued about 4 p.m. The town presented for some time a mass of burning ruins; and the coaches, unable to pass, were obliged to make a circuitous route. The fire reached from the place of its commencement on the eastern side of Culver-street to within three or four houses of the large house now occupied by Mrs. Yarde, and on the west side to where Mr. Taverner resides. It extended on both sides of Mill Lane as far as the house now in the occupation of Mr. Henry Rabbich. In Exeter-street, then the thoroughfare, the flames were stayed by an intervening orchard, adjoining the tanyard. On the west side of Exeter-street it ended at a house which has since been converted into Rose and Ivy Cottages. In Woodway the fire did little damage except in destroying the interior of the Presbyterian Chapel. From the centre of the town on the east it reached the house now occupied by Mr. Cleave, saddler. The old Church house, used as a school, escaped. On the west side of Fore-street the last house consumed was on the site of the residence of W. B. Scott, Esq., owing to the adjoining house having been pulled down. The town contained about 300 houses, of which about 180 were destroyed. The damage was estimated at £60,000. Time would fail to relate all the incidents connected with this tragic event; of all the hairbreadth escapes of those, who with what they considered valuable rushed hither and thither through the flames – many even having their clothes burnt on their backs; of sleeping infants in cradles, and the aged almost as helpless, who were removed from one supposed place of safety to another; of anxious housewives, loaded with china and glass, which, in their excitement, were hastily thrown down and smashed, while much that was really valuable and substantial was left a prey to the devouring element. The mortal remains of an old and highly respected inhabitant, Mr. John Searle, who had died suddenly at some little distance, had the day previous to the fire been brought back to his late home near the centre of the town. On the cry of fire the coffin and its contents were removed into the street, where they were in great danger of being burnt by the smouldering goods heaped upon and around them. The position of his father's remains was told the son, who was engaged with his burning house in Mill Lane, part of which was then arched over with flames. With truly filial affection, and to the imminent danger of his life, he rushed through the narrow burning street, in order that he might remove the remains of one whom be had dearly loved to some place of safety. He arrived not a moment too soon, for the pall that covered the coffin was found to be on fire, but this was speedily put out; and with the assistance of a few friends the remains were hurried to the churchyard where they were hastily interred by the vicar, two mourners being all that could be spared from the appalling conflagration to attend the dead to its final resting place. It was truly a providential circumstance that, amidst all the confusion of this awful scene, not a single human life was lost. Had the fire happened in the night it is dreadful to think what must have been the consequence. One valuable horse and a pig, which could not be extricated, perished. A small shop brought forward considerably beyond the other houses on the west side of Fore-street, occupied by Nat. Brimley, barber, and Mr. Strowbridge, watch and clockmaker, although surrounded by flames and not far from the explosion of the gunpowder, escaped. After the fire the watches were found hanging in the window as they were left, none the worse from what had taken place. The Church served as a refuge, and some families were located in tents in the Play Park, while the more fortunate found accommodation in the houses of their relatives and friends. It is pleasing to turn from so much misery to the unbounded benevolence manifested on this melancholy occasion. The sympathy of the gentry of surrounding parishes was greatly excited, and clothing and food were poured into the town in abundance. The Masonic fraternity of Teignmouth sent cartloads of bread and beer. The bell of the town-crier almost daily announced the arrival of these generous supplies, which were distributed in the Play Park. Boxes were fixed at each end of the town to receive the contributions of the many hundreds who came on the following Sunday from all parts. Subscription lists were opened far and near, and the liberality of the public throughout the country was unbounded. A committee was formed of which the grandfather of the present Lord Clifford was the chairman, and a statement being put forth, the sum of £21,000 was subscribed, which with the insurance covered the loss sustained. Besides this there was much private charity money, clothing, Bibles, and prayer-books which had no public record. The committee had no easy task in the distribution of such an immense sum, and their difficulties were greatly increased by strife and disunion among themselves. There was also much trouble in checking the avarice of many who swelled their losses to an amount altogether beyond the bounds of probability. One of the most able and indefatigable of the committee thus addresses the chairman in the preface to the report of the various sums awarded:– "In adjusting claims so multifarious and complicated, it cannot but be supposed but that some impositions may have been practised with success." On a perusal of the report we find that 409 persons were compensated. The compensations ranged from a few shillings to many hundreds of pounds. The two highest were to Mr. William Wright, malster, £1194 : 3 : 1, and Mr. Richard Rose, innkeeper, £1207 : 12 : 4. Mr. Rose was one among the few who made a good use of the money. He built a spacious hotel, which for some time after the Fire was called the King's Arms, but now the Clifford Arms. This house was well suited to the great amount of travelling through the town at that time. The old Market House was valued at £400, and a full compensation was awarded by the committee for the erection of another, which was built on the site of the King's Arms, where the Town Hall now stands. It was wretchedly planned and badly built. After a few years it fell into disuse and was pulled down. An act of parliament was obtained, June 1, 1808, entitled: "An Act for the better and more easy rebuilding of the Town of Chudleigh in the County of Devon, and for determining the differences touching houses and buildings burnt down or demolished by the late dreadful Fire there, and for preventing future damage by Fire." The town was soon rebuilt, and in 1811 there were 370 houses in the parish. 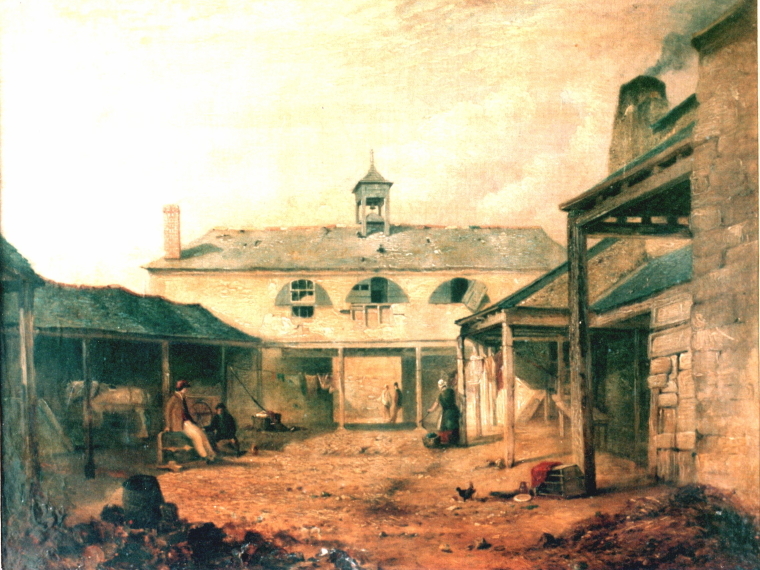 Though greater regularity might have been observed, the town was much improved in appearance, especially by the removal of the Market House from its centre. The Fire was for years an endless theme of conversation, and is even now, to some extent, a date for past events. "Before the Fire" and "After the Fire" have become household words. If ever a town should be grateful for great sympathy promptly manifested in unbounded acts of liberality in the hour of need, it is Chudleigh; and, although there is no record of its gratitude to be found inscribed on marble or brass, the recollection can never be effaced from its private annals.